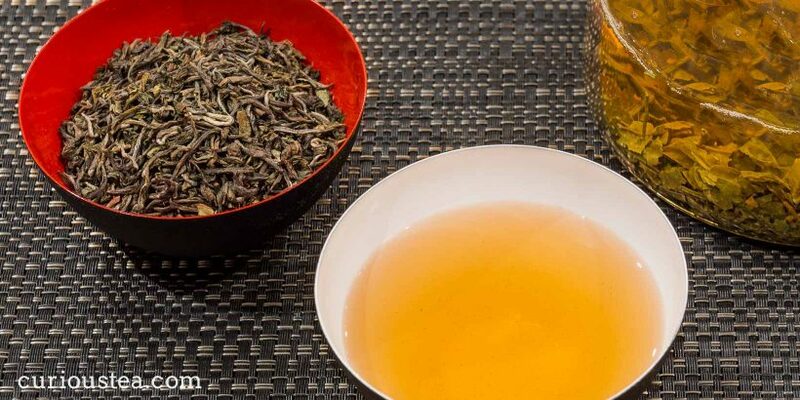 In April 2015 we are featuring the following gourmet loose teas for our subscriptions: A mood-lifting oolong from Taiwan, the famous Dragon Well and interesting Ping Needle from China, then a lovely darjeeling from the Singbulli estate. Mixed: Pine Needle (Song Zhen) and Dragon Well (Long Jing). 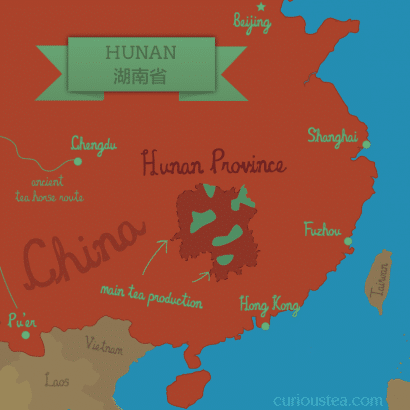 Welcome to another month of Curious Tea subscription selections! We had an exciting time selecting these fantastic teas to share with you. We hope you enjoy our selection, and to help you along with the tasting, here is some further information on all teas featured in our April Curious Tea boxes. Dragon Well is perhaps the most famous and popular tea in China. The harvest for this tea normally begins around the first week of April and last a few weeks. There are many legends and versions that try to explain the name of this tea. Our favourite is a legend, according to which a monk implored a dragon that lived in a well to come to the aid of villagers of an area that has been suffering from a drought. With the dragon helping out, the monk persuaded the villagers to pray and once they started, it miraculously started to rain. To celebrate this, the tea was named after the event – Dragon Well. Dragon Well is considered to be one of the Famous Teas of China. 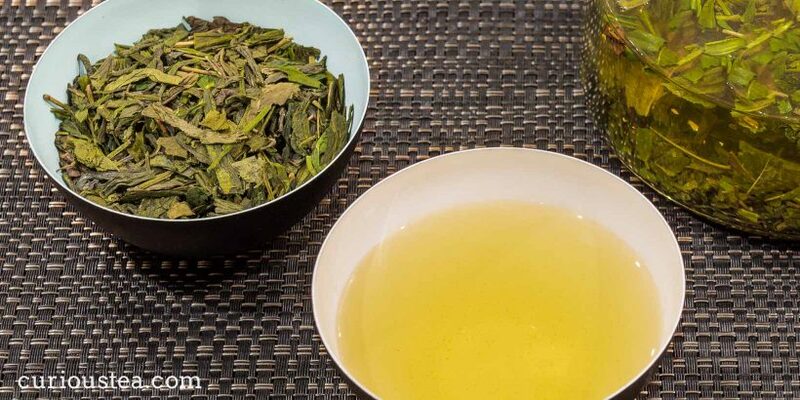 As with all green tea, the oxidation process has to be stopped by heating the tea, and in the case of Dragon Well this is achieved by frying the freshly plucked tea leaves in a wok for about 20 minutes. If the oxidation process is not halted, the enzymes naturally present in the tea will oxidise the tea, which will produce oolong (partially oxidised) and black (fully oxidised) styles of tea. This tea is still mostly produced by hand as the wok frying requires great skill. This particular Dragon Well tea comes from Zhejiang Province of Eastern China, which is where Dragon Well tea originates from. We chose this tea for our April Light and Mixed boxes. This Dragon Well has large, board, dark green leaves. When brewed it produces a bright liquor with a slightly fruity character that is sweet and a little toasty. Think a light yet full flavoured tea with hardly any astringency. This tea makes particularly good accompaniment to various foods and of course goes extremely well with oriental types of cuisine. This tea is best brewed with at 80c for 2-3 minutes. Brew multiple times, preferably in glass teaware to display the brewing leaves. 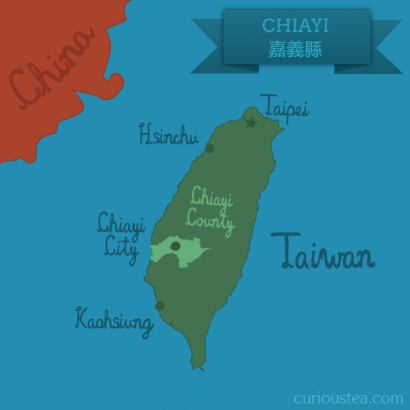 This tea is grown in the mountainous district of Alishan in the Chiayi County of Taiwan. Alishan is renowned for producing fantastic teas at high altitude and is considered to be one of the best tea growing regions of Taiwan. This area is also home to the Alishan National Scenic Area, a mountain natural reserve where most of the tea plantations are located. This area is known for outstanding natural beauty – the mountains in a sea of clouds is the postcard image of Taiwan! 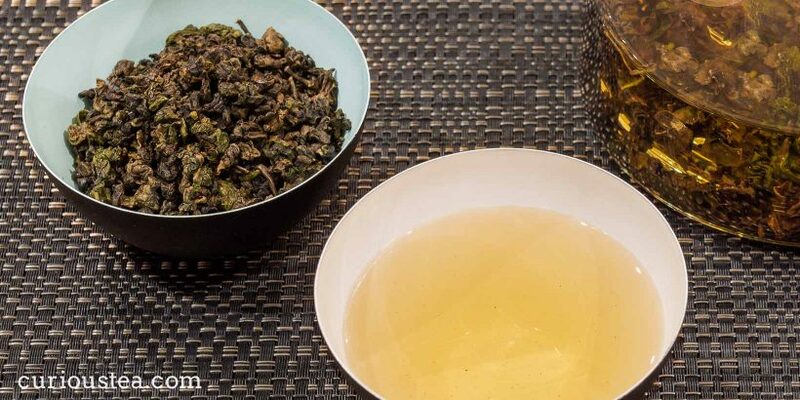 We selected this GABA Oolong for our April Light subscriptions. This tea has very tightly rolled dark green leaves that are typical of oolong teas. When brewed it produces a dark yellow liquor with a complex smooth, buttery, sweet taste and aromas of apricots and cream. This is a nicely floral and fruity tea, with a pronounced aftertaste of dried prunes and apricots. A very well rounded cup of tea with complex but very well balanced flavours. This tea is best brewed at 85c for 3-5 minutes. You can use glass teaware to enjoy those gorgeous leaves during brewing. Brew multiple times and savour the complexities of this tea from each steep. To get straight to the point, contrary to the name of this tea, it is not made out of pine needles! Instead this is a rare and unusual Chinese black tea made from the normal tea plant. There are of course recipes for making a ‘tea’ out of pine needles, but we decided that we should stick to Camellia sinensis. The tea plant that used in manufacture of Pine Needle tea is also used for manufacture of white teas as well as some greens (an unoxidised green variety of pine needle tea also exists). During manufacturing the tea leaves are shaped by machine into long thin needle-like leaves, which are black and gold in colour and resemble pine needles in shape. It is common in China to name teas after legends or simply after the way they look. In this case, it is the latter, and the name is derived from the pine needle-like look of this particular tea. This Pine Needle tea is grown in the Hunan Province of China. We chose this tea for our April Dark and Mixed selections. This tea has an unusual but very pretty black and gold leaf that is long and thin and somewhat pine needle-like. When brewed it produces a dark liquor with a smooth buttery flavour. There is just a tiny hint of smoke and chalkiness present on the aftertaste. Overall an extremely enjoyable cup of Chinese black tea that is slightly sweet and very smooth. Singbulli Tea Estate produces some fabulous teas, especially from the clonal cultivars. Clonal tea trees are not grown from seeds but rather are hybrids cloned for specific qualities. This results in clonal trees producing some amazing teas as the growers are able to select specific plants with certain particularly attractive qualities. This particularly focuses on taste and aroma hence some estates in Darjeeling specialising on clonal teas are able to produce quite spectacular results from these trees. This Darjeeling First Flush Singbulli is a clonal tea produced from the very first harvest of the year, immediately after the spring rains between the end of February and the middle of April. 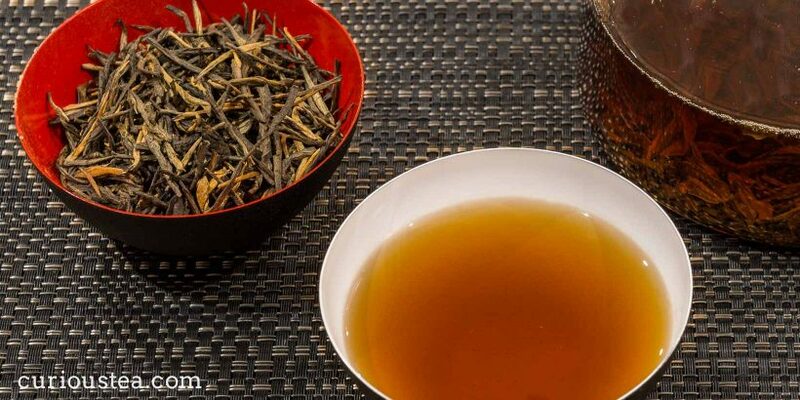 First Flush Darjeelings harvested at this time normally exhibit leaves of light appearance with a bright liquor and a delicate flavour and aroma. We selected this Darjeeling First Flush Singbulli for our April Dark boxes. This tea really stays true to its First Flush nature. Exceptionally well produced (hand rolled), this tea has small, neat mixed green leaves with silver tips. 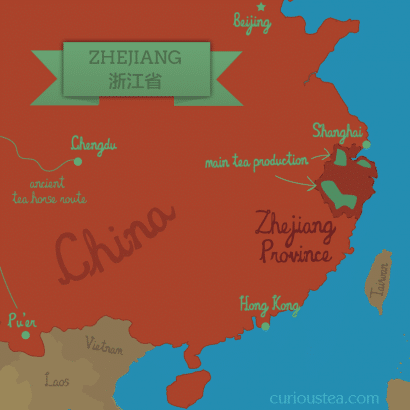 When brewed this tea produces a bright liquor with a delicate and clean first flush character. There are hints of menthol and eucalyptus on the aftertaste. A very delicious cup showing all the best features of a first flush Darjeeling. Like with all Darjeelings, it is best to let the water cool for a couple of minutes after boiling and before brewing this tea! We really hope that you enjoyed the tea club selection for April and are looking forward to what we have in store for your May selection. If you are reading this but do not subscribe to our monthly tea club and would like to receive our future choices, you can sign up in just a few clicks. We ship worldwide from the UK.